Have you tried Old Navy Pixie Pants yet? This is my second pair and I am in love. They look like a dress pant, but wear more like a legging. A while ago I gave some tips on buying printed pants and these definitely fit the bill. There are so many great options for prints and you can't beat the Old Navy price point. In fact, these pants are what help me feel confident about my look today. My favorite part is how they fit at the waist. The best pants are the ones that don't need belts, but aren't so tight to create any *ahem* unwanted bulges. You can see how else I have worn pixie pants with red, stripes, a graphic tee, and an embellished sweater. This week Carrie from Curly Crafty Mom is co-hosting. I've been following her blog for quite a while and love the variety of her posts. 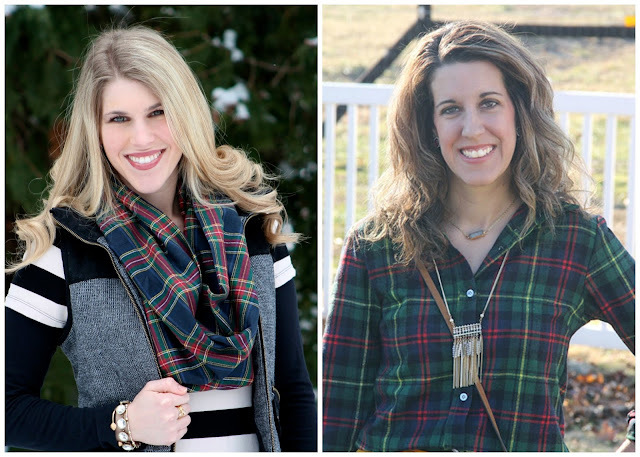 She shares fashion, beauty, home decor, and crafting ideas and tips. She really does it all! Super mom! Go check her blog out! I love these pants as well, the print is so perfect for this time of the year. Love how you paired it with the cozy sweater! The pants are great, love a good pair of printed pants. And the details on the sweater make it a standout. I so wanted Pixies to work for me, they come in so many awesome prints, but the cut just doesn't fit me right...they are perfect on you though! These pants are awesome indeed, love this plaid print. Such cute pants and I love the detail on your sweater!! Loving the whole look and how you tied it together with that necklace. Happy New Year! Those pants are awesome! I love the plaid and everything about this look! I wish I had the legs for those fab plaid pants! You look wonderful! Happy 2016, Dear! i love them and def see why they are your fave!! I don't blame you - those pants are fabulous and looks so cozy!! Happy New Year!! Plaid pants are still my favorite go-to. These are so cute! Happy New Year! I have a pair of these pants too and love them. Great look! Those really are such cute pants! You look amazing!!!! Love the pants! So pretty! I can see why these are your favorite pants, they are amazing! Love how you styled it. Thank you for hosting and hope you are having a fab week! Old Navy pants tend to fit me so well, which is wonderful considering how affordable they are! Love these on you, plaid is such a fun print. I have not tried ON's pixi pants yet, but I need to! I love his plaid pattern and I agree you don't want them to be overly tight. Love the zipper detail on your sweater and the color your bag goes perfectly! Thanks for having me as a co-host today! Those pants are so fun!! Love the plaid print with that cozy sweater too. Gotta love Old Navy, right!? I like the pants but the sweater and necklace combo has me swooning! Gorgeous look! Happy New Year, Laura! That sweater is so unique and perfect for these cold months. Have a great day! I totally see why these are you favourite pants--the plaid is awesome! Love the necklace too! Where to start; kept looking at the fab pants, then that unusual jumper, then back to the pants, then to the zip of the jumper! A great casual outfit. Happy New Year to you, Laura. I know there are a lot of blogging ladies who love the Pixie Pants. I like the fun plaid pattern on these! I almost bought some plaid leggings to wear a similar outfit with but thought they may be hard to style. Are those new boots by the way? I love them! You look great, Laura!! I'm so loving those plaid pants! I love this outfit, thanks for sharing and hosting! I'm loving zipper details on sweaters now, so fun! I should give Pixie pants a try. I normally shy away from printed pants because they don't look the best on me, but I haven't tried the Pixie pants yet! These are so cute, especially with that sweater! Those pants rock girl, love the wine color in them! I only own one pair of pixies which I haven't blogged actually but after Vivian's birthday I plan on buying some more and trying the Harper too. I love that long tunic sweater. Love pixi pants for being comfortable at work! Cute look, and the plaid is so perfect for winter! Fabulous look, my friend. Love the twist on that sweater with the black stripe/zipper. Fun pants, too! You always look polished and put together. Glad to see you "hanging out" with my pal, Carrie. Two fashionistas! Hey Laura! I know I already commented on this but just so you are aware, I pinned this outfit to the linkup board. Thanks for linking up with me!